We have such a unique shop that we felt the name “Vintage Market” did not individualize us enough. We want to be unique! 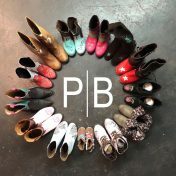 When people hear Pickin’ Boots Vintage Market, we want people to know exactly who we are! Our shop has so much to offer. We have vintage, antiques, salvage, farmhouse, clothing, IOD products, Dixie Belle Paints, hold workshops, repurposed items, etc. We have such a special group of women who are part of the shop. Such a supportive and friendly group. We all recently gathered and painted out boots in celebration of our new name. We plan on having several events, workshops and fun throughout the year. If you are looking for a place to have a special group workshop or class contact us for more information. There may or may not have been some shenanigans that night!! Pickin' Boots Vintage, A WordPress.com Website.